Yes, traffic fatalities have been (mostly) going down, but as long as cyclist and pedestrian fatalities keep going up, we can’t truly say our streets and roads are getting safer. That’s the message from 68 members of Congress to one pretty receptive audience: Transportation Secretary Ray LaHood. In their letter to LaHood, sent on Saturday, the 68 lawmakers – including nine Republicans — note that between 2010 and 2011, driving got safer: Roadway fatalities dropped 2 percent overall; 4.6 percent for occupants of cars and light trucks. But bicyclist fatalists went up 9 percent and pedestrian deaths rose 3 percent in the same time period. If it sounds like they might have gotten some ideas from people deep inside the bike advocacy world, well, you got that right. Hundreds of Bike Summit participants made this their key “ask” earlier this month when they visited their representatives on Capitol Hill. Apparently their representatives listened. SAFETEA-LU, passed in 2005, required states to set goals for reducing overall fatalities but included no specific reporting requirements for biking and walking. Without state attention, vulnerable road users have become even more vulnerable, with fatalities increasing both in real numbers and as a percentage of roadway fatalities, according to Caron Whitaker of the League of American Bicyclists. 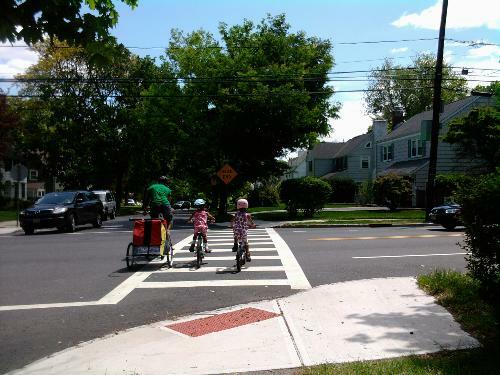 “In over half of all states, more than 10 percent of roadway fatalities are bicyclists and pedestrians but yet only seven states report investing in any bicycling and walking safety projects,” she added. Could increased focus on reducing bike and pedestrian fatalities lead states to limit or dis-incentivize bicycling? They might (incorrectly) assume that fewer people on bikes means fewer people dying on bikes. Whitaker says Metropolitan Planning Organizations will see to it that the performance measures aren’t interpreted that way, and if for some reason a state did use the focus on safety as an excuse to limit biking, they’d be hearing from activists – and mayors, and community leaders – pretty quickly. They also note that such a measure wouldn’t divert funding from other safety needs. The timing of the letter is good. U.S. DOT is still working on drafting MAP-21 performance measures, and the agency is paying special attention to bicycle safety this month. The right of everyone to be as safe as possible in the streets is an important issue–one which should cross political lines. I’m troubled by the subtext here: “68 lawmakers – including nine Republicans…” How can Republican lawmakers be in such a minority on public safety? Why is there a Democratic near-monopoly on the matter? Do my more conservative friends not care about it? That doesn’t make any sense. Where is this money going to come from to pay for the new bicycle lanes?. I know that driving got safer because of higher gas prices and people not working they are staying home as they have no money to spend. I am all for bicycle safety and new lanes, but I don’t want to borrow money from China to do it or print money that devalues our currency. Possibly via just one less billion dollar highway project? What the heck? Click that link to the letter! in reducing deaths of pedestrians and bicyclists? came around asking for more signatures? During the Bike Summit, I personally visited the congressional offices of the Brooklyn and Staten Island representatives, and handed them the ‘ask’ for traffic safety. No reps were available to meet with, just aides, and at some offices, not even the transportation aide was available. But all had the Bike Summit package delivered. So far, not even my representative, Yvette Clarke, has responded on our request. Jerry Nadler, thank you, you are Mench (honorable person). As to paying for making our roads and streets safe for all traffic, and pedestrians and bicycles are traffic, that actually should be paid for as a necessary part of the construction and maintenance of every roadway. Bike/Ped safety is not and should not be an option that gets put in only if there is a few extra dollars sitting around. This includes bike lanes, cycletracks and sidewalks as necessary. Design, build and maintain properly for all users safety from the get-go. As to specific safety projects; as noted, non-motorized users account for 10 percent of the body count. But if you look at the allocation of dedicated safety money, you will find most states spend from 1 percent to zero percent of their funds on bike/ped safety. 99+ percent goes to fixing motor traffic, only. A fair allocation based on the body counts would be a good place to start looking for funding. The first step in the request is to get complete and reliable data on crashes, which then leads to allocation by needs. The highway law says there will be data collected and analyzed, but federal highway and the states are not doing this. Without the data, who knows what to change and how to change it? And the data collection/analysis part is very low cost. They just have to take the need seriously for it to get done. Even most of the fixes are a small percentage of the total roadway’s costs. What’s missing is the will to do it, not the money. Pretty sure the cost of building and maintaining roads is a drop in the bucket compared to, say, the F-35 program. We don’t need the F 35 program do we? Lets get rid of all defenses like Obama is doing. Deals with Russia, our on Government and the United Nations getting rid of 2nd Amendment (Guns). What do we need Defense for when we can have bicycle lanes in DC. Don’t worry about N. Korea shooting nuclear missiles at us or Iran throwing a few bombs our way. Lets get our priorities straight we need our groups to make sure recreational fun is first. LETS GO OUT AND RIDE OUR BICYCLE. We don’t have jobs, vacations, homes, food, defense as American People have got to give everything they have so the elite can survive. What about us surviving? How about NOT giving money or F 35’s to Egypt and middle eastern countries that HATE us and take care of our Country and maybe a BICYCLE lane wouldn’t be a problem. How about priorities and spend for important things like the deficit. Take care of PRIORITIES. Do you think those bicycle lanes will be important when another Country takes over America because our economy collapsed because we were Stupid? Government doesn’t have to pay for everything. If bicycle lanes are that important instead of groups lobbying and spending money to get the Government to pay….. let those groups build at their expense and save the rest of us. Gayla does what all irrational folks do…. makes a distorted charicature of the position which is placed before her. Naughty, Naughty, Naughty. The main point is that Bikes can be transportation. Not all transportation … but useful amounts of transportation. Bikes were here before cars… and started the “Good Roads” movement in 1880. The AAA picked up on it after 23 years – in 1903. Since then some car lovers have wanted to shove all bikes off of the roads. That is a Naughty Naughty Naughty thing to do. A simple fact is that Gasoline Dependency has been a major contributor to needing a “War” department (we now call it Defense… since the Military Industrial Complex – which Eisenhower warned about- wanted it re-named). I must say that Bicycles and Electric cars (Powered by the sun on your roof) can transform our society – it’s fuel needs, it’s military needs, it’s morality. Bikes got good roads for us in the beginning. Respect Your Elders… the elders on the roads are the bikes. Respect them… and make a safe place for them to continue to provide safe transportation – while reducing health care costs .. through developing fitness. In my 70th calendar year I still happily ride bikes … and when appropriate drive my Volt (carefully to respect bike riders and pedestrians). I am about to ride one of my bikes to the store and get some needed items now… please excuse me for leaving abruptly.